Our 2 schools in Granada offer Spanish courses in the heart of Granada. Students at our schools study Spanish from 1 week up to 36 weeks. The Spanish lessons are mainly in the mornings, with optional activities in the afternoons, evenings or weekends. Studying Spanish in Granada provides you with the opportunity to learn the language in a truly 'Spanish' location. Granada is undoubtedly one of the most beautiful and atmospheric cities in Spain. The magnificent palaces and gardens of 'La Alhambra' are breathtaking, as are the views from the old Moorish part of the city, 'El Albaicin' with its winding streets, white-washed walls and Arab-style tea shops. However, Granada is also a modern, vibrant city, with an exhilarating atmosphere and a charm of its own - a wonderful place to learn Spanish. Nestling below the snow-capped peaks of the Sierra Nevada - the highest mountains in mainland Spain - yet at the same time a little over an hour's drive from the warm beaches of the Mediterranean, Granada has a unique location, and offers the visitor a unique mixture of old and new, East and West, mountain and beach. Our main school in Granada occupies a traditional building with courtyard and terrace in the heart of Granada, just 1 minute away from the main square and 5 minutes away from the Alhambra Palace. Wifi access is available through the building and students can borrow study materials from the school's library of books, Spanish films and music. Our second school 'Granada Old Town' is located in the 'Albaicin', the oldest and most beautiful part of the city. There are 8 classrooms, student cafeteria and a magnificent garden with orange trees. Views from the school look directly at the 'Alhambra', over the Albaicin. There is a maximum of just 6 students per class. All accommodation is within walking distance of both schools. Fly to Malaga or Granada. Direct express coach service Malaga-Granada. Why not improve your skiing/snowboarding as well as your Spanish, combining a Spanish course in Granada with skiing in the Sierra Nevada, the most southern ski station in Europe. Just over an hour away from the city by public transport! 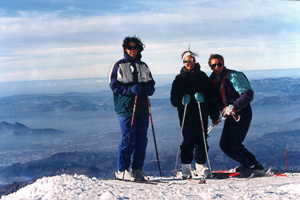 The Granada Old Town' school offers a Spanish and Ski course which combines 1 week (minimum) of Spanish lessons with 1 week of skiing. The programme includes a 5 day ski pass and daily transportation to and from the ski slopes! The staff at our school will be pleased to advise you as regards accommodation, ski hire, transport etc.